Airlines are very heavy users of social media. They vie with competitors to reply to their customers online in the most efficient manner possible, offer the best possible rates and the greatest experience. 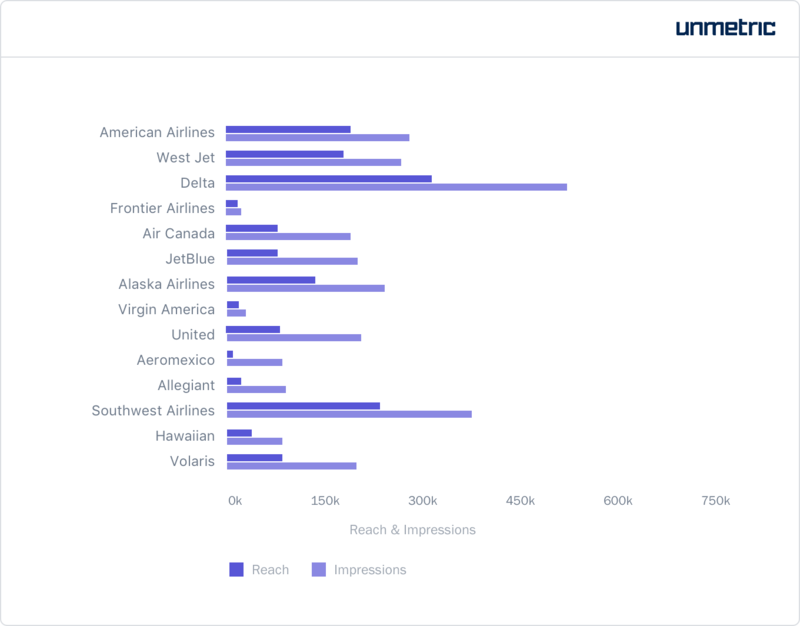 In addition to redressing consumer concerns, airline brands use social networks to engage their audience with relevant content and pass along information about flight schedules, new routes, discounts etc. This way, social media plays a key role in constructing a brand’s personality online. 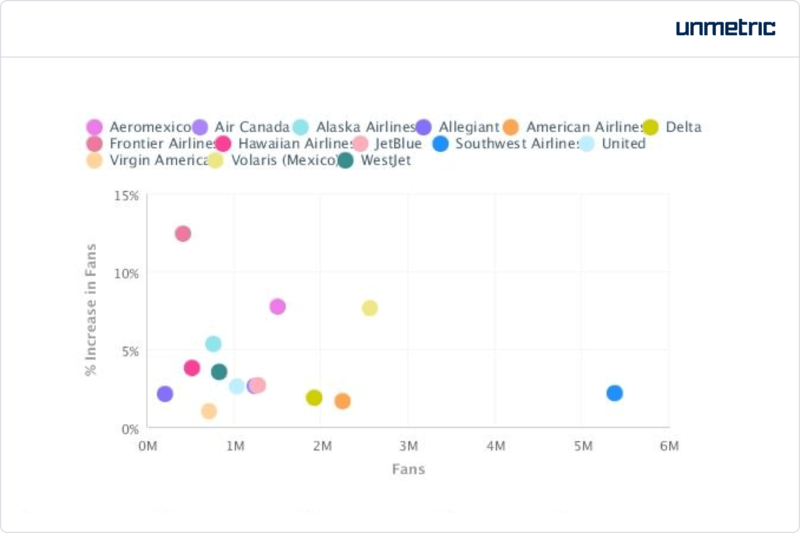 In order to understand how effectively airlines brands used social media, we took a look at the top 15 brands across Facebook, Twitter, and Instagram during Q1 2017. The brands that we studied here showed no correlation between the number of times they posted to Facebook and the engagement they received. Volaris posted the most but this did not really translate into engagement. The brands that witnessed high levels of engagement had disparate posting frequencies. A rule of thumb going forward could be to post just enough that your audience doesn’t forget that you exist, while not inundating their NewsFeed with irrelevant content. If you are still unsure how frequently you should post to Facebook, Xia can help. Every industry and competitor set is different and she can help you find answers based on your past data and industry trends. With more likes, shares, and comments per post than any other campaign, Delta’s campaign stood out. In this campaign, Delta created content around Women’s History Month. Instead of a run-of-the-mill greeting, they showed how they were personally invested in this occasion by sharing stories of their female employees, both past and present. 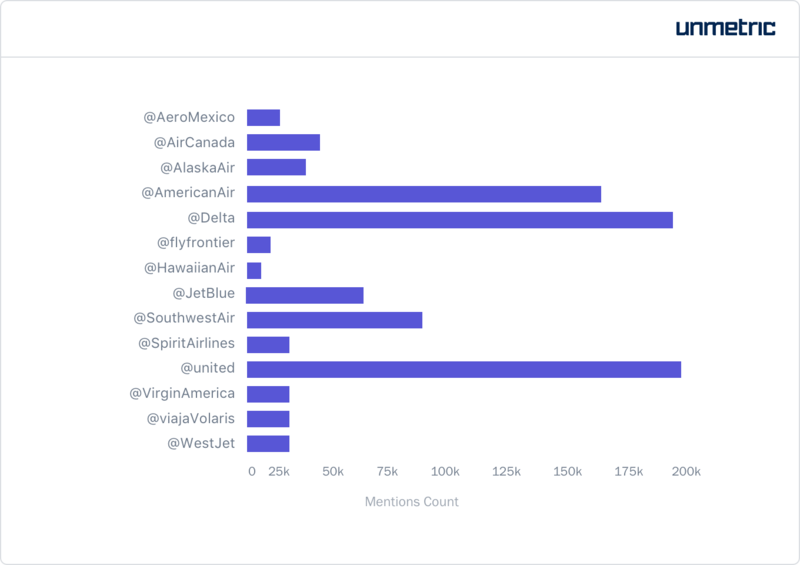 Who is more engaging – Delta or WestJet? 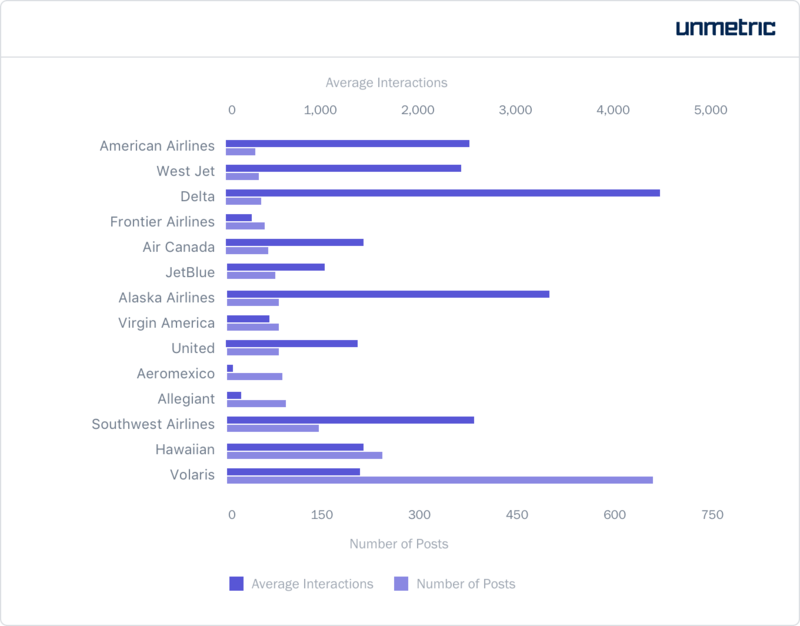 From the previous graph, it is evident that typically Delta receives more interactions than any other airline brand on a single post. However, this calculation considers likes, comments, and shares to be of the same value. 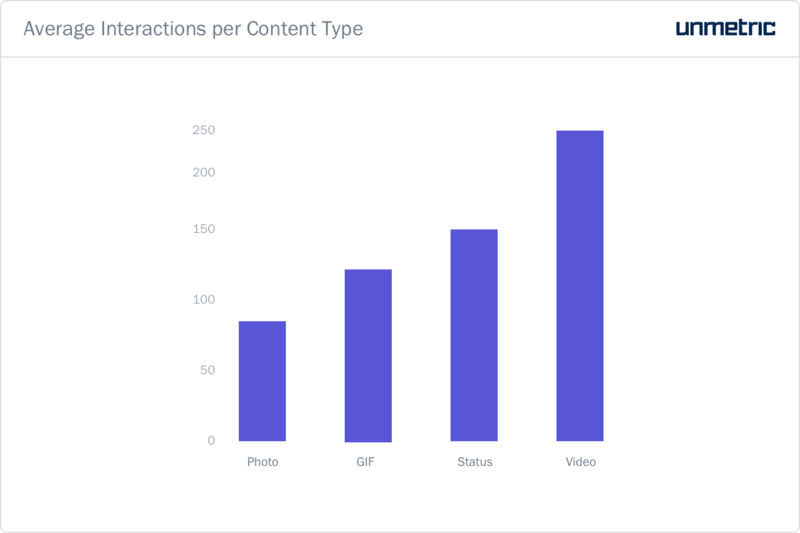 While all interactions help make your content more discoverable on users’ NewsFeeds, a share has a more direct impact on the number of people who get to see your post. When someone shares your post, it means that their ‘friends’ get to see it. Also, a ‘friend’ recommending your content attests to its credibility. 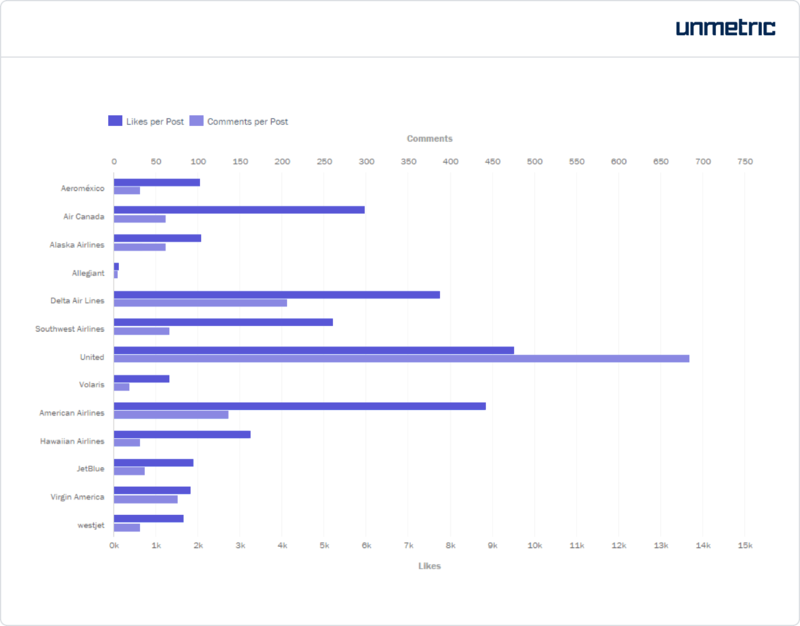 Using Unmetric Analyze, you get to decide how valuable a ‘share’ is in relation to a ‘like’ to you. This way, you get an estimate of engagement that suits you best. Here, WestJet takes the lead in the number of shares they received. Here, the post disseminated information about a controversial regulation. Social media audiences discussed the pros and cons of such a step thereby shooting up the tally of shares and comments. 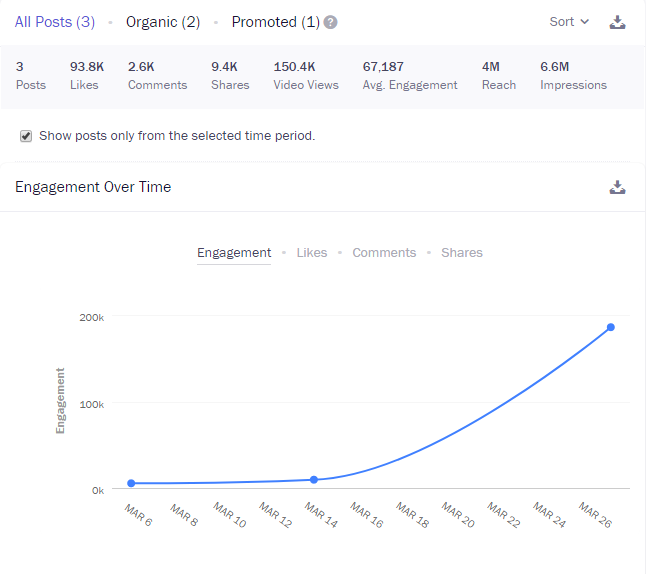 In evaluating WestJet’s social media strategy, it’s debateable whether the engagement received by this post should be included in the analysis as it was more a result of it’s news value than a pre-planned social strategy. 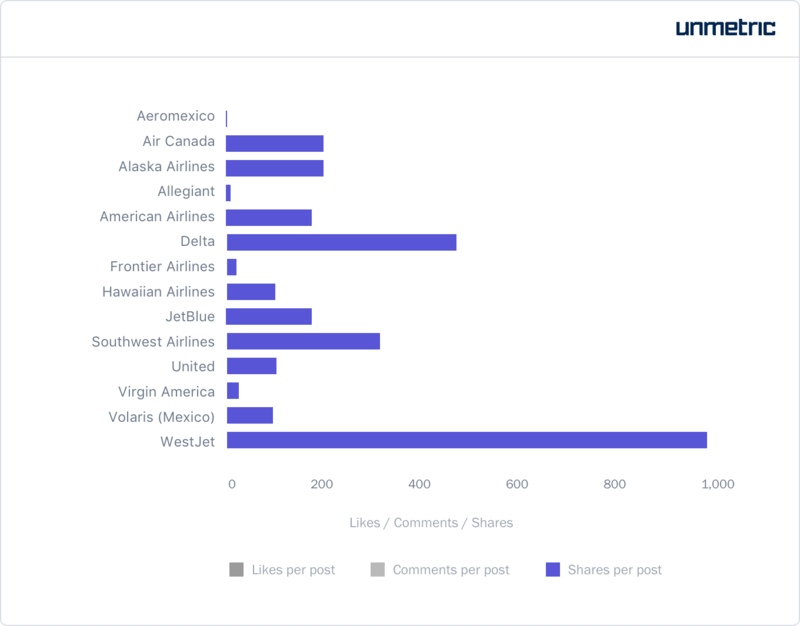 However, even if you exclude this post, WestJet still remains the brand with the most shares per post. What makes WestJet’s content so shareable? The gap between WestJet’s most shared post (excluding the one earlier) and the post that got the next highest number of shares is huge. While Delta’s post scored around 8,500 shares, WestJet’s video below had more than 19,500 shares. There are a few reasons why this post works. One, it is funny. You cannot overstate how important great content is in social media marketing. Two, it joins brands and other humans in the April Fool’s tradition. Three, it is part of a campaign that advertises their #MostCanadian sale. Sales, contests, and giveaways offer significant rewards for your audience, thereby motivating them to engage with your content. Finally, the post was promoted. 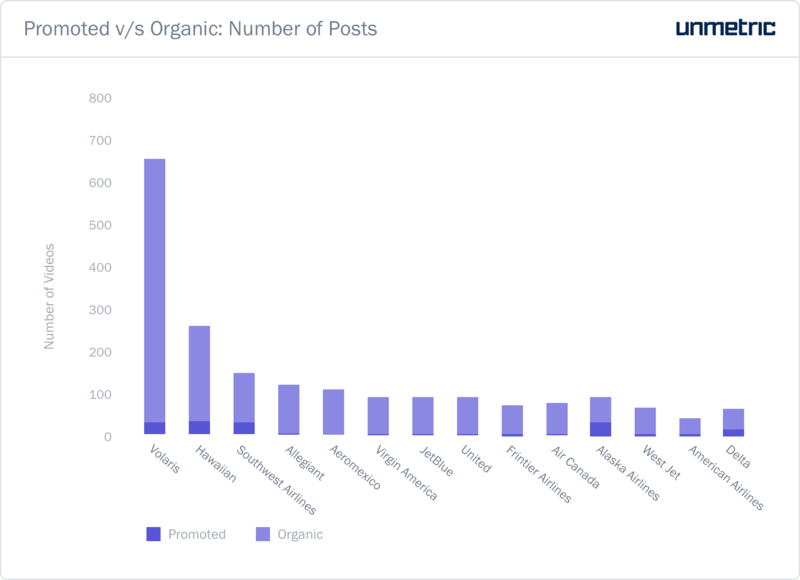 With the decline in organic reach, brands have to judiciously allocate a part of their social media budget towards boosting their posts. 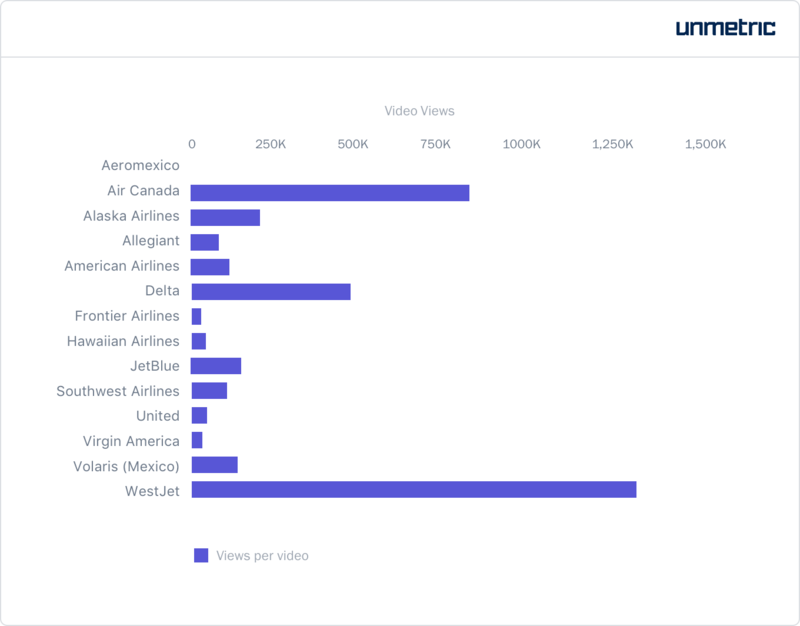 Alaska Airlines promoted their content the most (40%). Delta came in second with 32% of their posts having money behind them. While this in itself may not mean much, promotion has a definite impact on the reach and engagement brands receive. Delta’s content reaches the most number of people. This is to a large part because of promotions. Their shareable content and significant community size also worked in their favor. Even though Alaska Airlines promoted a bigger fraction of their content, they fall behind on these two counts. Southwest Airlines enjoys the largest audience size. Their content as well as the user comments about their amazing customer service is a very plausible reason why they enjoy such a huge fan base. Their posts usually involve a pithy story along with appealing visual content. 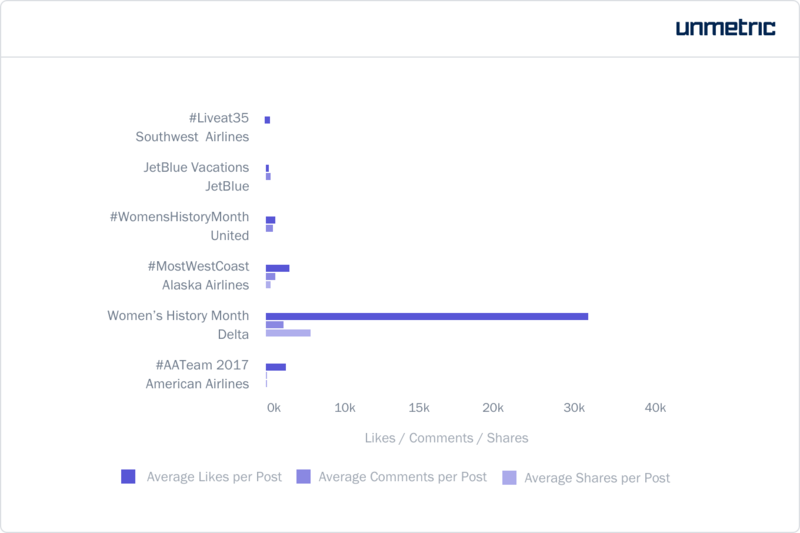 During the three-month period studied here, airline brands owed the most part of their interactions to posts containing photos. Over 62% of all interactions (likes, comments, and shares) were brought in by photos. This justifies the fact that more than 60% of all the content published by airline brands in Facebook consists of photos. WestJet and Air Canada stand ahead of the pack. However, the reason they are ahead of Delta, for instance, is because they posted far fewer number of videos. While Delta has 24 videos during the first quarter, WestJet had only 9 and Air Canada 5. Since video content usually involves greater expenditure than other forms of content, it makes sense to stick to an optimum volume and ensure that these perform well. Marketers need to plan these videos well by consulting past data for duration, tone, topics and other elements of strategy that have worked. Over 20% of all the videos published by the brands studied here were promoted. A fair degree of promotion can guarantee that the effort you have put into video content reaches a good chunk of your target audience. Volaris was just as prolific on Twitter as it was on Facebook. Overall, brands tweeted much more than they posted on Facebook. This is because of the nature of the platform. 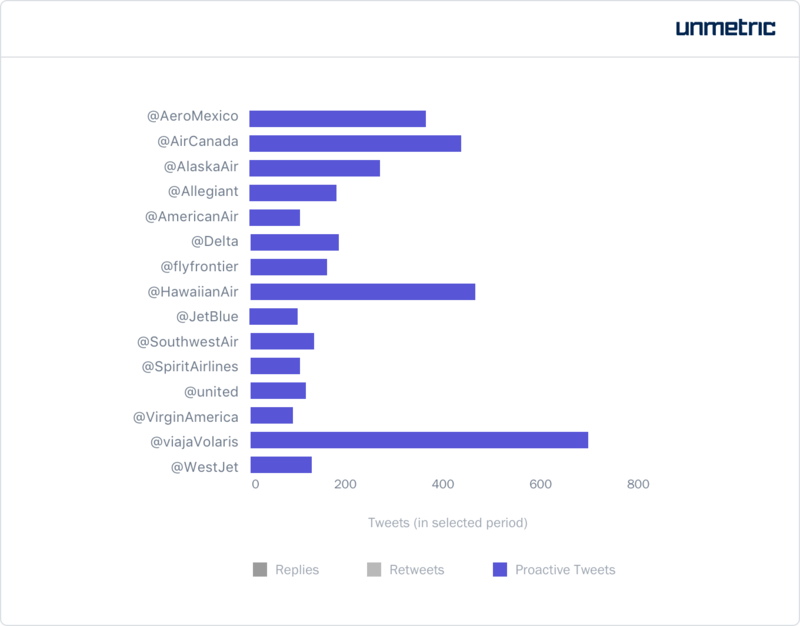 Airline brands heavily use Twitter to reach out to their customers, communicate updates to them etc. Delta aced the engagement tables on Twitter as well. The brand received more likes and shares per post than any other brand in this group. American Airlines got the most replies on their tweets. 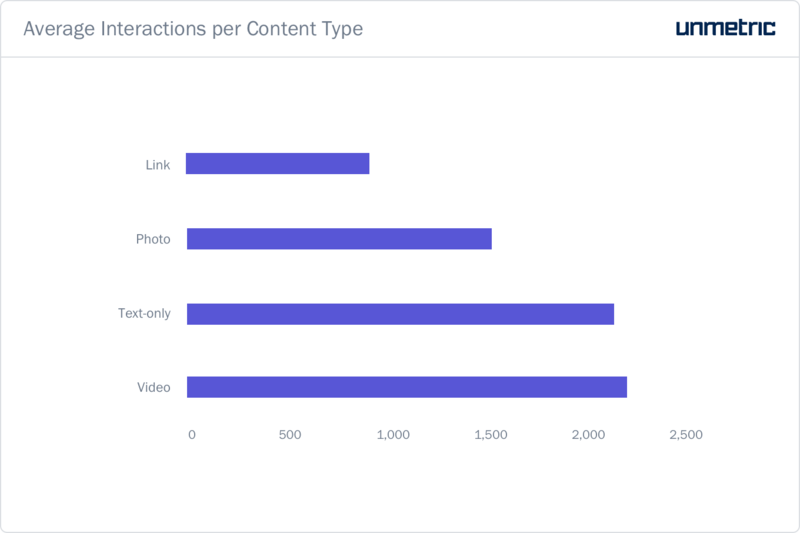 Here too, video content garnered more engagement than other content types. While the average tweet from brands in this group received close to 140 interactions, those containing videos brought in 240 interactions. However, plain text and links are responsible for over 90% of all of Delta’s interactions. On a medium like Twitter, brands can’t hang up their boots after posting a few great videos. It is imperative that they engage their audiences consistently with a mix of content types. In order to estimate the composition of your content types, consult past data and industry trends. Another important function of Twitter for brands is customer service. Brands receive large volumes of queries, complaints etc on a daily basis. They often have dedicated social customer service agents to address these issues. A prompt response has a direct relation to customer satisfaction. 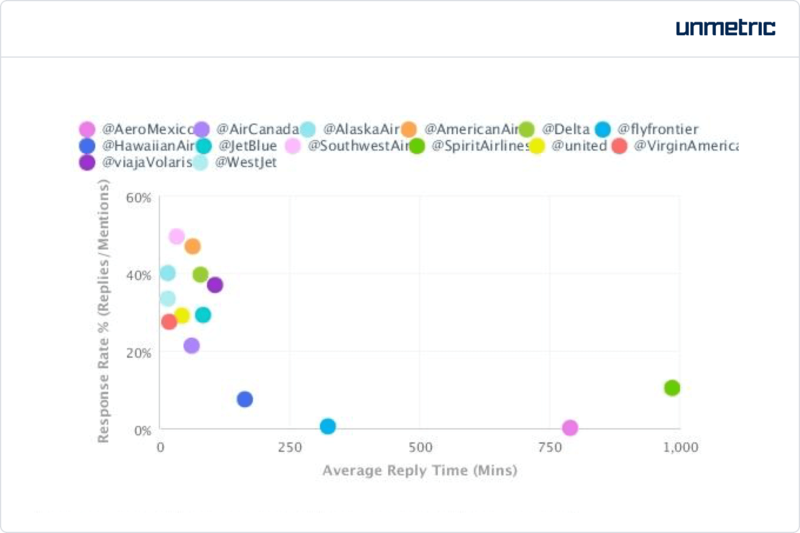 Southwest had the best response rate while Alaska Airlines and WestJet replied the fastest. 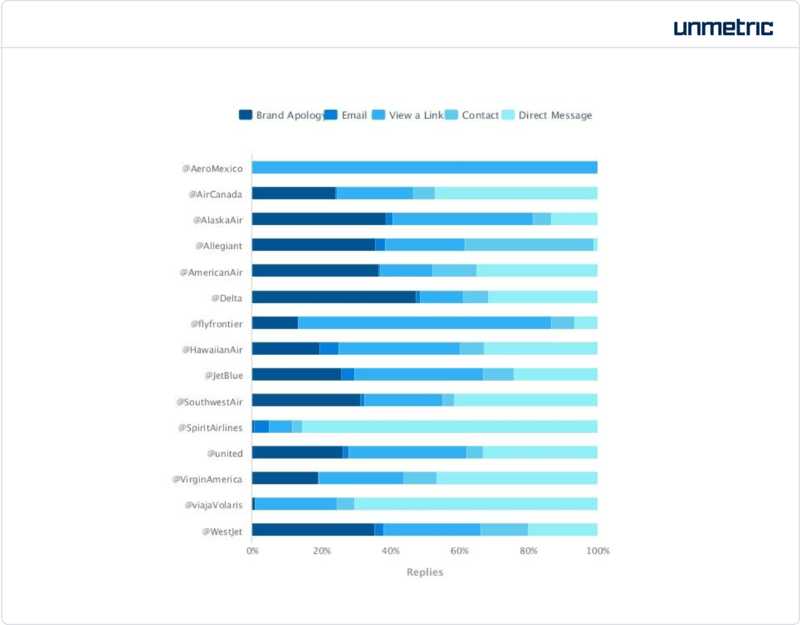 Mentions are a clear indicator of which brands social media audiences are talking about the most. These are not in response to a brand tweet, but are tweets by users who reference the brand in some context. 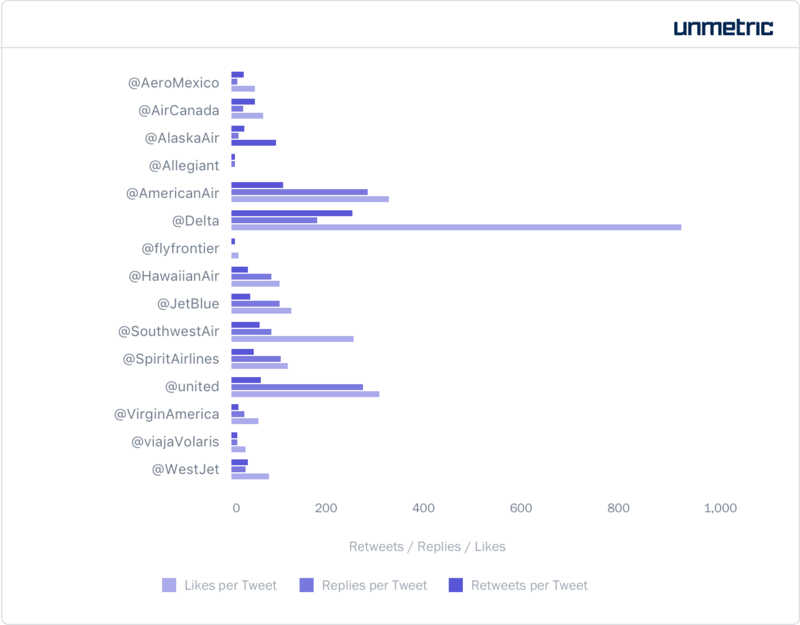 Unsurprisingly, United was the most mentioned brand from the time period studied here. These included tweets from users who pitched in on the first of several PR crises to hit the airline when they didn’t allow two young passengers to board for violating the dress code policy of their company benefit travel program. Instagram is an essentially visual platform with little scope to move users outside the app. The insular nature of Instagram means that brands should use visuals to define their brand personality rather than using it as a business conversion platform. Connecting with your target audience is not just about visual brilliance but also about conveying an idea or experience using the same. Frontier Airlines and Spirit Airlines did not have a presence on this social network. Quite like the other platforms, frequency of posting had little or no correlation with engagement. 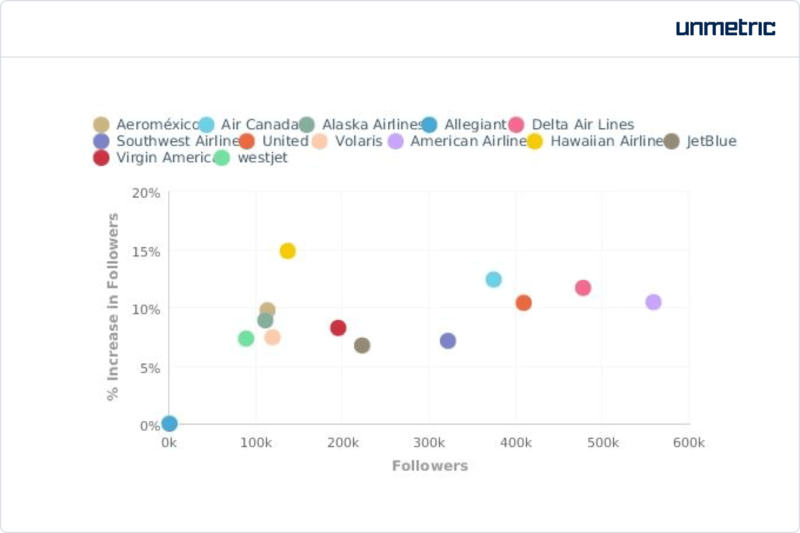 Hawaiian Airlines posted the most to Instagram. A popular strategy across the board on Instagram is sourcing user-generated content. Close to 60% of all the posts were attributed to users. This is a great way of sourcing content. It also helps the brand to tap into these Instagram users’ follower networks. 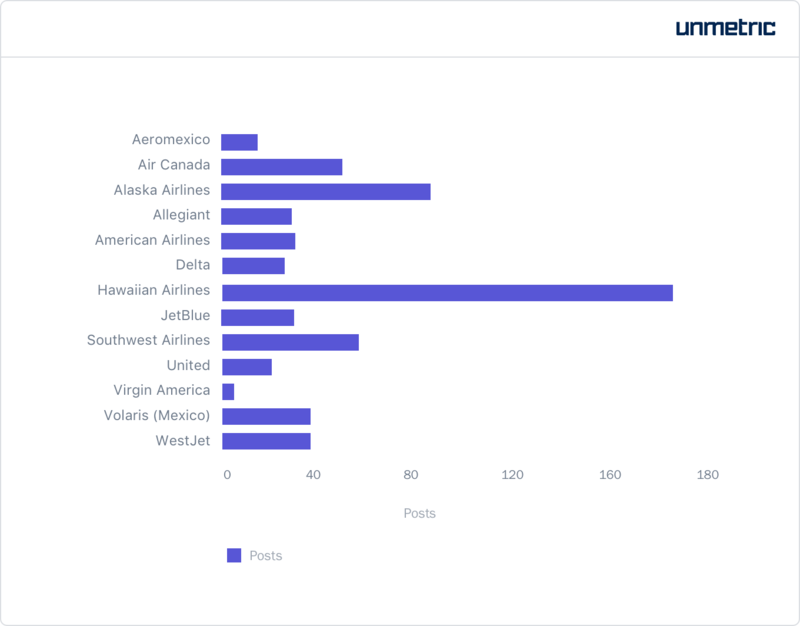 United’s most engaging post was a user-generated post too. Of their 28 posts, 24 contained such content sourced from instagrammers. Spectacular as the picture was, the comments tended to be around United’s PR crises. There was a very strong correlation between the number of followers a brand has on Instagram and their average engagement. This indicates that brands should focus on building their follower base on Instagram. This way, they can benefit from good levels of organic engagement. Take a look at the number of followers each brand has on Instagram and the growth they experienced. While these findings and analyses are particular to the brands studied here, there are lessons here for brands in other sectors too. In order to estimate the optimum posting frequency, content strategy and to plan your campaign, consult past data. If that sounds like a lot of work, you can get Xia, our AI to mine these insights from data. ← Have Brands Picked Facebook over YouTube for Video Marketing?